This tart makes great use of all the zucchini and summer squash that continues to produce here at Tumbleweed Farm. It may be early September but the squash plants will continue to produce well into the fall so having simple recipes like this savory tart is always a good thing. I used my favorite almond flour crust recipe for the shell and could not be more pleased with the texture and flavor. This tart is a great weeknight meal when served with a simple salad and glass of your favorite summer wine. If you live in the area, swing into the Hood River farmers market on Saturday to pick up all the ingredients to whip this up! We’ll be slinging veggies from 9-1pm in the Full Sail Brewing parking lot. Hope to see you local folks there! Preheat the oven to 400F. Grease a 9 inch pie plate or tart pan with oil. In a mixing bowl, stir together the almond meal/flour, garlic, basil, salt and pepper. Drizzle in the olive oil and water and stir until the mixture is thoroughly combined. Press the dough into your prepared pie plate until it is evenly dispersed across the bottom and up the sides. Bake until the crust is lightly golden and firm to the touch. About 18 minutes. While the crust pre-bakes place the zucchini slices in a strainer and sprinkle them evenly with the salt. Let them drain for about 20 minutes, then spread them out on paper towels to drain for an additional 15 minutes. In a medium sized bowl mix together the ricotta cheese, lemon zest, lemon juice, and 1/4 cup Parmesan cheese and a pinch of sea salt. Spread the cheese mixture evenly over the pre-baked crust. Layer the zucchini, overlapping the slices on top of the cheese. Place the squash blossoms over the zucchini slices and sprinkle on the julienned basil. 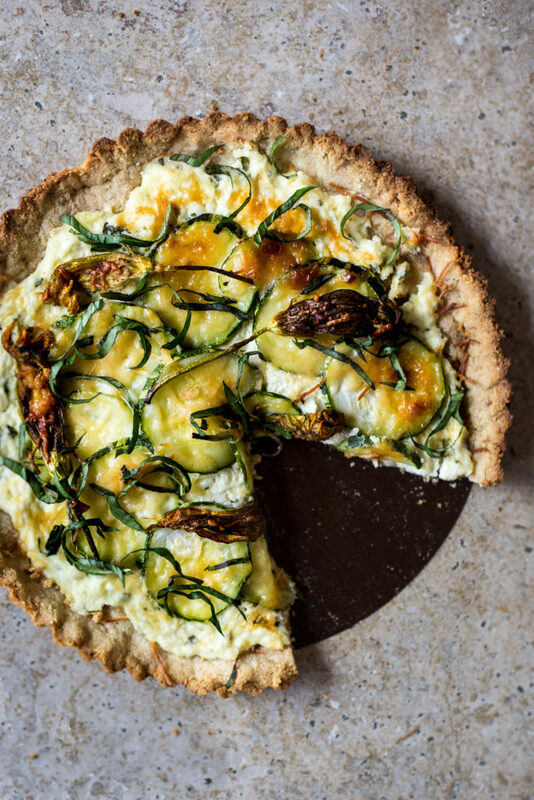 Top the tart with a few pinches of parmesan cheese and a light drizzle of extra-virgin olive oil. Place tin foil around the edges of the crust and place the tart back in the oven. Bake until the cheese is bubbling and the crust is golden. About 40-45 minutes. It says 6 ounces of ricotta, this is 170 grams right? And doesn’t seem like it would be enough to make a tart, is it 170 grams?